Last year I posted about a barred own that showed up outside my work window. It's that time again. 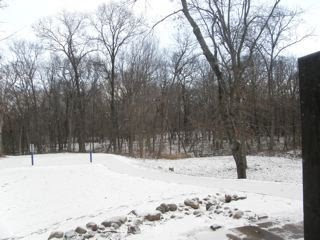 Here's a photo I took today from inside the building looking out across the yard and septic field. I'm guessing this is the same owl. 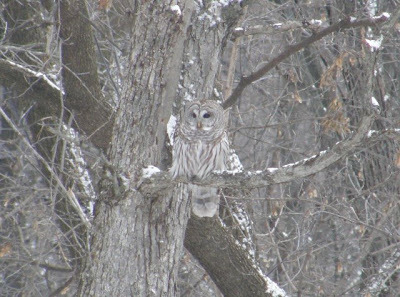 Go back and check out the photos from last February, that's the same tree, but the owl is on the next branch down. 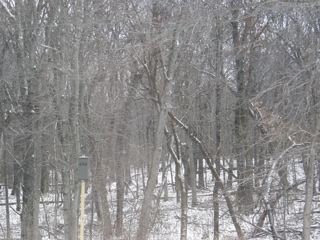 This is a nice opening in the forest so the owl must be hoping to spot some small mammal running under the snow. On the other hand. 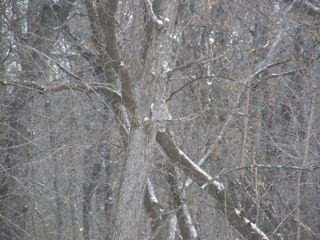 About 75 feet away on the opposite side of the field is the mew with our female captive barred owl. We are getting near mating season.